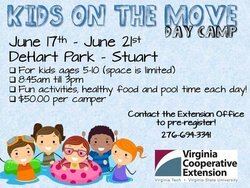 Kids on the Move Day Camp sponsored by The Patrick County Extension Office (276-694-3341). Dates of Camp: June 17th - June 21st, 8:45 AM - 3:00 PM. Location: DeHart Park in Stuart, VA. For kids ages 5-10 years of age. $50 per camper. Fun activities, healthy food and pool time each day. Space is limited - contact The Extension Office for more information or to register at 276-694-3341.